Feel free to share this video with your industry friends today! TAN is the premier grassroots organization promoting the value of the land title insurance industry. In the current regulatory environment, our industry faces threats of new policies at both the state and federal levels that could seriously affect our business. TAN provides an ideal opportunity to present a cohesive and energized voice on behalf of the industry. TAN membership is FREE and it only takes two minutes to sign up by clicking here. As a member you will receive action alerts for relevant state and federal issues. Rather than flood members' inboxes, TAN is strategically designed to ensure that you are only notified about issues that will affect you, your business, and you customers. 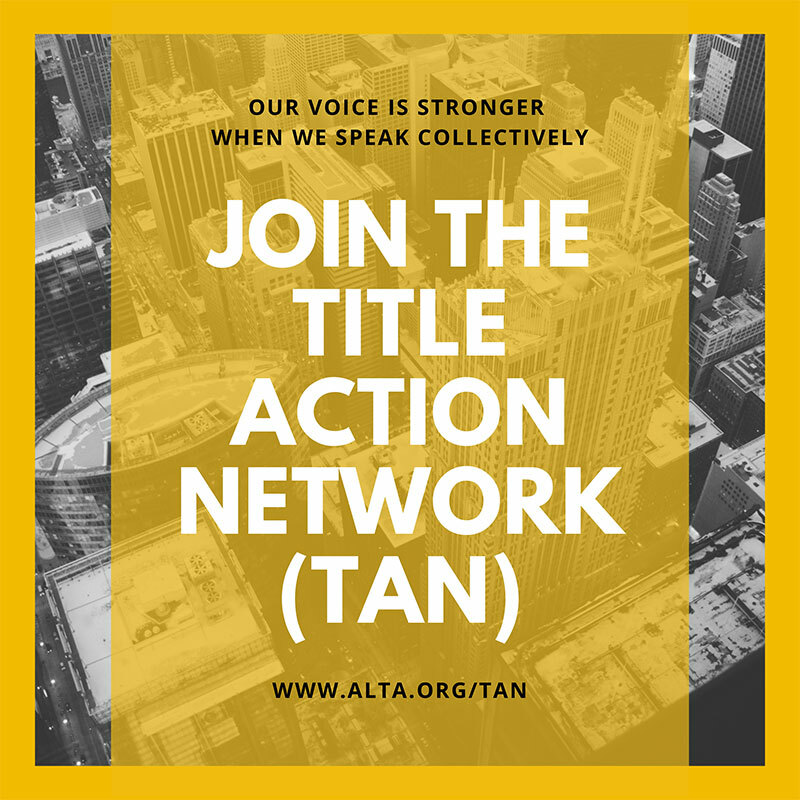 You don't have to be a title company executive, branch manager or business owner to participate in the Title Action Network (TAN). TAN promotes the value of the land title industry and allows you to advocate from anywhere with our user-friendly website. TAN is fast, free and easy-to-understand. The larger our network becomes, the stronger our voice will be. TAN relies on the grassroots efforts of individual members to succeed so join TAN today! Quick and free to join. Not going to clog your email or take up your time. Easy-to-understand and provides brief advocacy updates on issues important to you. Focused on ensuring state and federal legislators understand the value of the land title industry. 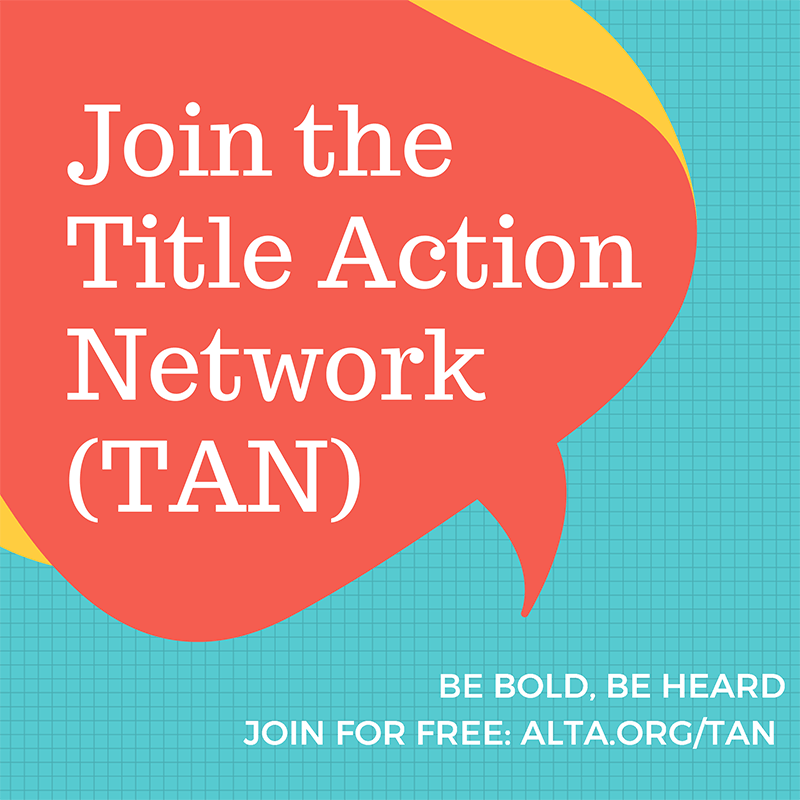 You do not have to be a member of the American Land Title Association (ALTA) to join TAN. Join or Renew TAN Now!